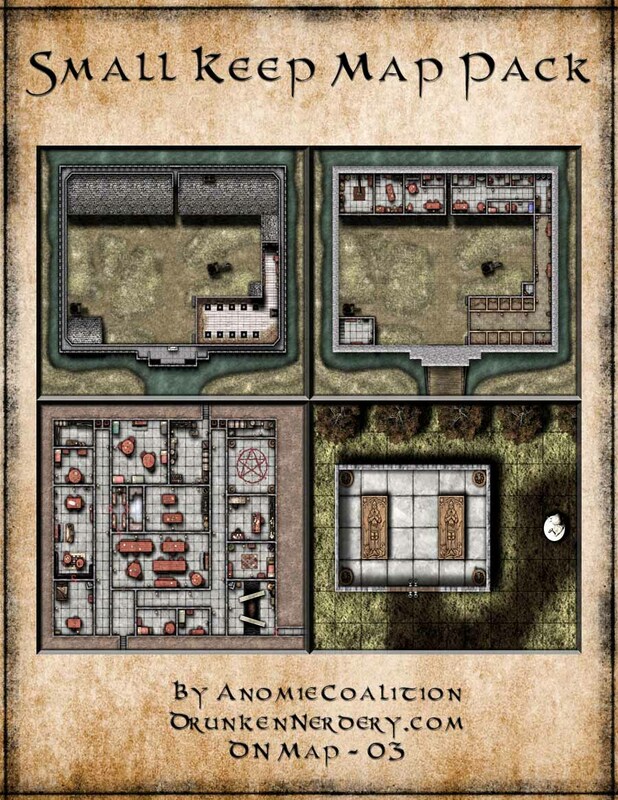 Hey all – Recently had a commission for a small keep and was allowed to retain the rights to make it a map pack for sale on DriveThruRPG for only $2. Great for anyone looking to plan a big encounter for their players or players looking to buy a keep. This Map Pack contains: Maps for Battlements, Ground Floor, Cellar Complex, and Mausoleum for a small keep. The Battlements and Ground Floor have the same landscape except that the Ground Floor map depicts the draw bridge down. The Cellar Complex contains a secret passage that leads to a ladder hidden beneath the statue in the Mausoleum Map. The Mausoleum is presumably found somewhere outside of the Keep’s walls. These maps were drawn at full scale (5’ square = 1”) and the Keep measures at about 150’ x 200’. Each map is provided in .JPG file format to either take to your local print shop or upload to your favorite VTT. Because of the size, I have included a full resolution and half resolution copy of each in the ZIP file. I have also included a non-scaled version of each map with and without labels (except for the Mausoleum which didn’t require labels or scaling). Each map is also provided in this PDF for at home printing. There will be a GM map with labels followed by successive pages of scaled images of that map (with the exception of the Mausoleum). Each page is overlapping &frac;12; inch with successive pages to the right and below the previous page. Print each page as Letter sized with no adjustments made to scale. The Battlements and Ground Floor should be printed in landscape orientation while the Cellar Complex should be printed in portrait orientation. After they are printed simply cut away the white border and glue/tape pages together so that the overlapping parts match up for a seamless map. Categories: Uncategorized | Tags: Battlemap, castle, D&D, dnd, keep, Pathfinder, RPG, stronghold | Permalink.